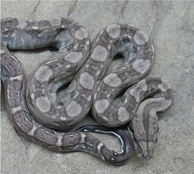 These Boas are Nicaraguan Farm bred boas. I received a bunch of them from Ben Seigel Reptiles back in 2001. They are beautiful pure blooded Nicaraguan Hypo Boas that they stay small and have unbeleivable Colors. They take a few years to get their mature colors - but when they do they can rival even the best Salmon or Orange tail Hypo Boas. I beleive that these dwarf boas will become very popular - simply because of their small size & beautifull colors. Females breed at around 1500 grams & males at 500 grams. However, they grow quite slowly & it could take 3-4 years to acheive this size. In 2003 one of my 48 inch Adult Hypo Nicaraguan bred and gave birth to a small litter of Boas. Amazingly enough this Hypo Trait works the same as the Salmon Hypos in that it is Incomplete Dominant. Out of this litter I got Super Hypos - Hypos & normals. Check the Pics below - These Hypos are Awsome. 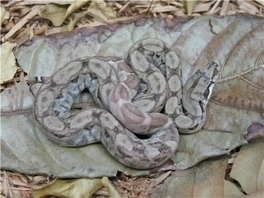 Anerythristic Boas are lacking all red pigment. The result is a grey, black, white & Silver Boa. 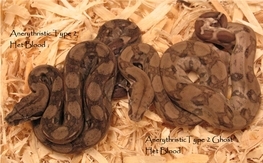 There are currently two types of Anerythristic traits associated with the Nicaraguan Boas and they are "Anerythristic Type 1 " and Anerythristic Type 2" boas. The Type 1 trait is lighter & more common amongst the Hypo Nics. While the Type two trait is more uncommon and was started from wild caught Nicaraguan boas that were almost jet Black with dark eyes. This particular trait is not compatible with the Type 1 Anerythristics that I produce with my Hypo Nics. I have proven this by breeding a Type 2 Black tail to a Hypo nic that is het for type 1 Anery. The result was no Anerythristics at all. This Black Tail Anery type 2 color phase is probably one of the most desirable & Rare of the pure Nics. 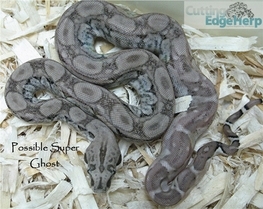 Ghost Nicaraguan boas are a combination of two traits ( Hypomelanistic & Anerythristic ). I was fortunate enough to prove out that a few of my original wild caught Hypo Nics were also heterozygous ( gene carriers ) for Anerythristic. So I have produced ghost Nics in a few litters each year. See pics below. Update 2015 - If all goes well I should have some Ghost & Type 1 Anery Boas by July.